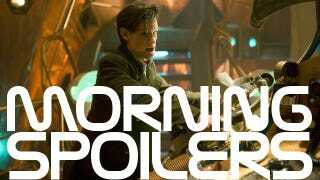 Tons of spoilers for the return of Doctor Who. Plus a new Man of Steel plot synopsis! Elizabeth Banks promises the eccentric look of her Hunger Games character will be faithfully adapted. The Dark Tower is still happening...maybe. John Noble explains how to play two Walters at once on Fringe. Plus a Game of Thrones casting update! Here's a set video featuring more of the big battle scene. "There are some special effects, but I have to say a lot of it is practical. A lot of running around in the woods and the arena is a very real sort of place." Here's a red band clip, in which the vampire Jerry (Colin Farrell) tries to get the upper hand on his human prey. "When a string of grotesque killings begins to strike her small city, private detective Randi Wade becomes suspicious. A serial killer is taking the skin of its victims and the grisly murders remind her all too much of her own father's death almost twenty years ago. As the police hit a dead end, Randi goes on a search for answers of her own... But when a close friend suddenly becomes a target, he is forced to reveal a startling secret about himself and Randi is quickly pulled into a dark underworld where monsters exist and prey on the living." Here's an introduction for "Let's Kill Hitler" from Karen Gillan. - We see River Song. - Martha, Rose and Donna make an appearance as a hologram / picture or some sort. - Fishfinger Custard makes a return. - Watch out for the 'Order of the Silence', 'Numbskulls' and 'Corn Circles'. Our resident Doctor Who spoiler machine bluehinter explains that the creature in this promo photo is a "time-traveling robotic jellyfish." They're effectively the monsters in "Let's Kill Hitler", functioning as "antibodies" when people try to alter the course of history, which might come into play when one, say, tries to kill Hitler. "I will be coming back at some point… There is an involvement in some way." "We do have arguments with ourselves. Most people seem to have this conflict within themselves and it can be quite vicious when you tend to say, 'That was stupid. What are you doing?' [The Walters] will build it up until such time as they realize they're being childish and they have to put this extraordinary brain into one piece to solve a problem larger than their own egos." Here's an interview with Pam actress Kristin Bauer. You know I've grown to think of these structures — the house and the barn — as anthropomorphic. They have spirits, is how I've approached photographing them. You look at the house and I try to make that thing look vicious. I try to give it eyes and a nose and see what expression it might be feeling. And Greg Melton designed a barn that you'd swear is alive. It's got two hayloft windows up above for eyes, there's a little central thing to pull hay in that looks like a nose and the barn doors themselves are a mouth. And by God I make sure the farmhouse looks like it's alive. I'll give the upstairs windows a little glimmer as if this thing is lifting its eyelids, and looking out like a crocodile. What does that make the barn? That's something else. What would that be? A rattlesnake. I was really worried about that because I think that General Beckman delivering missions is a very easy way to tell television. I think for us, we were really worried about that, but the truth is that's very exciting. It's neat. Even here in the final 13 episodes, to kind of reboot the show… The way that the show works is that Chuck and Sarah now have to go out and get missions. They need to sometimes work with kind of nefarious individuals. They need to make this company work. They started with the highest of ideals, but the spy world is a complicated place. So we really have a lot of fun early in the season with how this is going to work. Because you start off going, "Ah, man! This is complicated!" We'd figured out how this was going to work before, but now it's kind of fun coming up with new ways to tell our Chuck stories. And Chuck doesn't have the Intersect anymore. So from a story perspective, we have to break the show in a little bit of a different way. But I think that's a good thing. It's like, why not tell the story differently? Why not come up with a new way to tell a Chuck story? Oh, yeah. We definitely want to bring some characters back this year. Hopefully we'll bring back some that the audience really wants to see and maybe a few they don't. "They know about Chuck's spy life now. They know about the [freelance spy] company. Things have changed. It's much more of a family story." Jo has wedding ideas for Henry and Grace; the Department of Defense sends a relationship auditor to assess Carter and Allison; Tiny's return threatens the town with poisonous gases. Sen. Wen conducts final evaluations of the Astraeus candidates, and the aspiring crew mates are fitted with memory-reading devices that expose their inner motives for wanting to join the mission; Carter and Allison wear the memory-reading devices as part of their appeal to reverse the ruling on their relationship; bizarre attacks occur around town that could threaten the Astraeus mission.